This study examined language and executive functions (EF) in high-functioning school-aged individuals with autism and individually matched controls. Relationships between executive, language, and social functioning were also examined. Participants with autism exhibited difficulty on measures of expressive grammar, figurative language, planning, and spatial working memory. A mixed profile of impaired and enhanced abilities was noted in set-shifting. While controls showed the typical increase in errors when shifting sets from an intra-dimensional to an extra-dimensional stimulus, this pattern was not noted in participants with autism. Relationships between EF, language, and social performance were weak to non-existent. 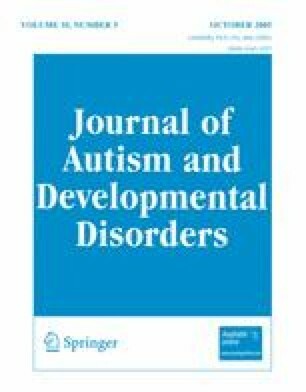 Implications for theories of core deficit in autism and dissociable nature of the language and executive impairments in autism are discussed. The authors wish to thank all participants in this research endeavor, who gave so generously of their time and energy. We also wish to thank Tracey Brown, Erin Garth, and Marcella Radano for their assistance in data collection. We thank Andrea Schanbacher for her help with administrative support during the final preparation of the manuscript. We are grateful to the Rita Rudel Foundation and National Institutes of Health (PO1 HD 35468 to RJL & K01 MH 01824 to MCG; and MH 52432R29) for the funding to conduct this research.